Ages 2 through Adult. Use the APPSI to obtain assessment results relevant to planning effective intervention for individuals functioning at the lowest levels of mental development. The APPSI is designed specifically for clinicians working with clients of any age who are preverbal and functioning at a mental age of 0 to 8 months. The APPSI is individually administered in 30 to 60 minutes. Discover clientsâ€™ preferences for visual, auditory, and tactile stimuli on the receptive side, and also for social interaction and methods of communicative output. You will find the test aligned with Piagetian sensorimotor framework of stages I through III. The APPSI aids in defining preferred methods of communication, which is most useful for planning instruction to enhance the independence of these individuals. The APPSI is not normed, but it was piloted in 3 states with 32 individuals (ages 2 through 24) who have severe and profound impairments. Reliability coefficients for the test range from .76 to .92, indicating a very high level of reliability. 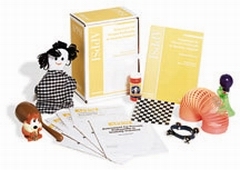 The kit includes the Test Manual, 25 Record Booklets, 25 Profile/Summary forms, a set of cards and several other manipulatives, all in a sturdy storage box.